Combine all the ingredients in a mixing bowl and mix well with your hands! 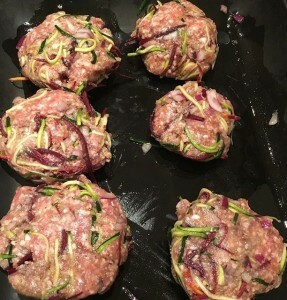 Form the meat into 6 patties, making sure they are well pressed together. Put the burgers on a baking tray and drizzle with a little oil. Put them in the fridge for 20-30 mins to set a little. Preheat the oven to 180°C. After 20 mins, put the burgers in the oven and cook for around 40 mins. Serve in pitta/burger buns, with salad and any condiments you like. Dalia Haber is a primary school teacher who is passionate about cooking. She recently turned her 5 years worth of Instagram posts into a website & blog. She aims to inspire busy people that they can cook fresh, healthy & varied meals from scratch, by simply using what they have in their kitchens.